Maximilian Guillon was born in Niort, in western France around 1852. His full name was Pierre Marcel Maximilian Guillon, but he was generally known as "Maximilian Guillon" or "Max Guillon". Maximilian Guillon was the eldest son of Anne Sophie Euphrosine Th�olinde Moreau and Jean Fr�d�ric Valentin Guillon, a French merchant. By 1861, Jean Guillon was working as a merchant on the island of Jersey in the Channel Islands. When the 1871 census was taken, Jean Gullion was established as a commercial agent in St Helier and he was living at a house in Museum Street with his wife Annie, and their three children - Maximilian, then aged 19, Leopold Alexandre (born 1855) and Marie Louise Angele (born 1856). Maximilian Guillon is described in the census return as an "Agent's Clerk" and was presumably working for his father. Sometime in the 1870s, Jean Guillon and his family moved on to England. Jean Gullion ended up in Plymouth, Devon, where he died in 1881, at the age of 60. After the death of her husband, Annie Th�olinde Gullion and her two youngest children settled in Bristol, where her son Leopold Alexandre Valentin Guillon (1855-1945) - generally known as Alexandre or Valentin - set himself up as a photographer. Under the name of "Valentin Guillon", Alexandre Guillon established a photographic studio at 23 Lower Ashton Terrace, Bristol around 1886. Trading under the name of "Valentin Guillon", Alexandre later worked from a studio in Fishponds Road, Bristol, where he was based until 1905. Around the same time that his brother established himself as a professional photographer Maximilian Guillon embarked on a photographic career. Maximilian was primarily an "outdoor photographer", and in the 1870s he was taking photographs of various residential properties in North London. During this period, Maximilian Guillon was working from 10 Stanley Road, in the Holloway district of North London. On 10th March 1878, Maximilian Guillon married Ellen Jane Archer (born c1858,Cheshunt, Hertfordshire) at St Paul's Church, Islington, North London. The couple's first child, Ellen Martha Guillon was born on 30th November 1878 at Clapton, near Hackney in East London. Within a few years, Maximilian Guillon was living at a small house in Oliphant Street in the Kensington & Chelsea district of London. On 15th March 1880, a second daughter, Florence Emily Guillon, was born at 114 Oliphant Street, near Queens Park in North Kensington (then part of Chelsea). When the 1881 census was taken, Maximilian Guillon was residing with his family at No 91 Oliphant Street, West London. Maximilian P. M. Guillon is described in the census return as a "Photographer", aged 28. On 10th November 1881, some six months after the 1881 census was taken, Maximilian and Ellen became the parents of a third child - a son named Henri Leopold Maximilian Guillon. By 1886, Max Guillon and his family had left London for the South Coast. Max and Ellen Guillon, together with their three children, settled in the Westbourne area of Aldrington, a parish just two miles west of Brighton. This part of Aldrington was to become known as West Brighton and within a few years the Westbourne district itself was absorbed by the rapidly expanding borough of Hove. Max had worked in Brighton as photographer in the 1870s, when he was a young, carefree bachelor. Now a married man in his mid thirties with a wife and three children to support, Max Guillon decided to establish his home near the fashionable residential districts of Hove and Cliftonville. [RIGHT] Maximilian Guillon listed as a professional photographer at No.4 Westbourne Mews, Aldrington, in the trades section of the 1890 edition of Kelly's Directory of Sussex. By the early 1890s, this part of Aldrington had become part of West Brighton. [ABOVE] Portrait of Pierre Marcel Maximilian Guillon (c1852-1940), generally known as Maximilian or Max Guillon. Born in France around 1852, Max Guillon worked as a photographer from the 1870s until beyond the First World War. This photograph was taken at the end of his long career as a professional photographer. [BELOW] A carte-de-visite view of a large London house photographed in the 1870s by Maximilian Guillon of 10 Stanley Road, Holloway, North London . [ABOVE] The reverse of the Max Guillon carte-de-visite photograph shown below. Instead of a printed back detailing his business details, the photographer has written in ink "Max Guillon. photo. 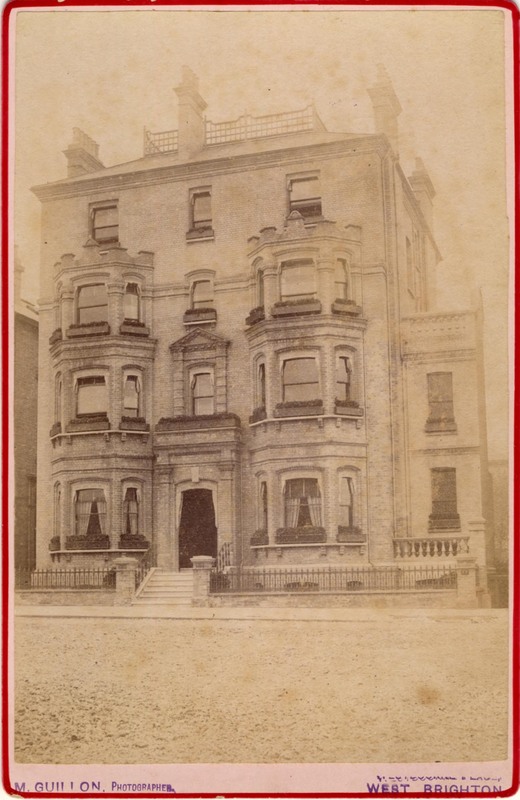 10 Stanley Road, N."
[ABOVE] A carte-de-visite view of a large London house photographed in the 1870s by Maximilian Guillon of 10 Stanley Road, Holloway, North London. Throughout his early photographic career, Max Guillon specialised in taking photographic views of private residences and grand houses. [ABOVE] A carte-de-visite view of a grand house in Brighton photographed by Maximilian Guillon in the 1870s. 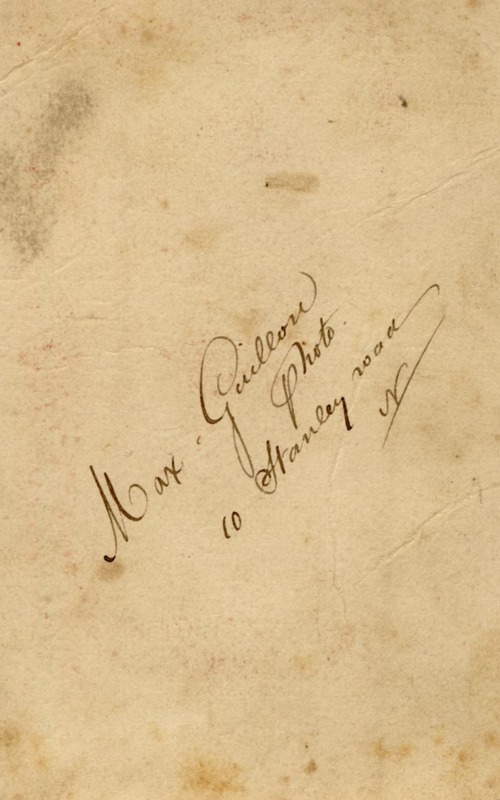 On the reverse Max Guillon has written "Max Guillon. photo. 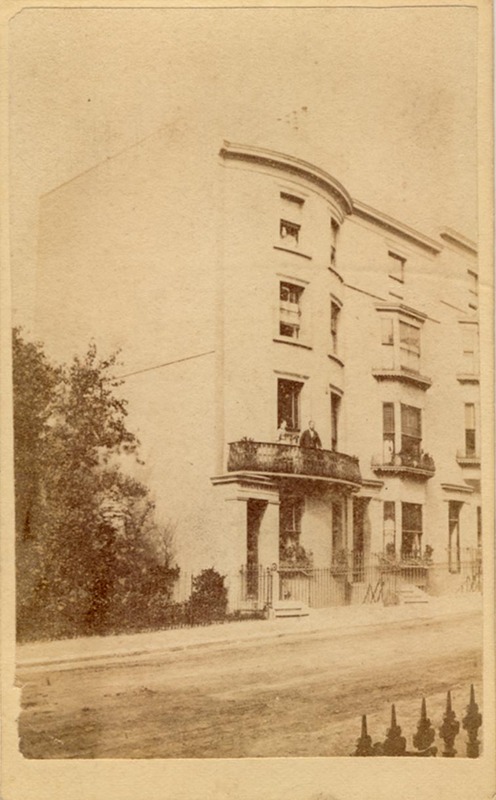 54 Lewes Street, Brighton.". Lewes Street is in the district of Hanover and lies between Albion Hill and Southover Street. Although Max Guillon took photographic views of grand and impressive buildings, his own lodgings were in a humble area of Brighton, inhabited by house painters, shoemakers and small shopkeepers. Max Guillon returned to the district of Brighton & Hove around 1887 and settled in West Brighton (Hove). [ABOVE] The reverse of the Max Guillon carte-de-visite photograph shown at left. As with the cartes produced in North London, Max Guillon has hand-written his business details in ink. 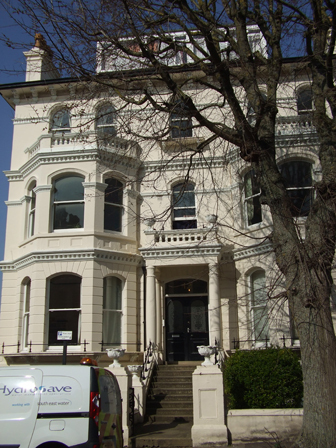 The address is given as "54 Lewes Street, Brighton". Most carte-de-visite photographs carry a printed advertisement on the reverse. In the 1870s, designs on the backs of cartes were in most cases fairly elaborate and carried details of how to order further copies and other services offered (e.g. enlargements, finishing in colour ). The plain and basic details provided by Max Guillon reflect the itinerant nature of his work. It appears that Maximilian Guillon worked primarily as a travelling photographer, specialising in "outdoor work" and so, in the early part of his photographic career at least, it seems that he did not need to maintain a permanent studio in London. A carte-de-visite by Max Guillon, which shows a couple standing on the balcony of a grand house in Brighton, appears to date from the early 1870s [see illustration on the left]. On the reverse of this carte, the photographer has inscribed, in pen and ink, his details - " Max. Guillon - photo. 54 Lewes Street, Brighton ". The address of 54 Lewes Street, Brighton was probably a temporary one. Guillon was likely to have been a seasonal visitor and would find lodgings for the period of his stay. 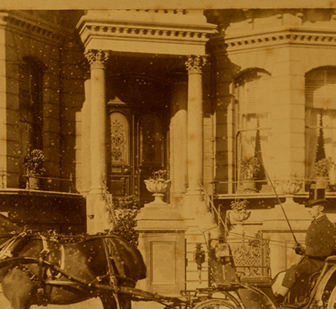 The style of the carte and details in the picture itself, suggests a date in the early 1870s. This would have been before Maximilian's marriage to Ellen in 1878 and some years before he settled in the Queens Park area of West London. 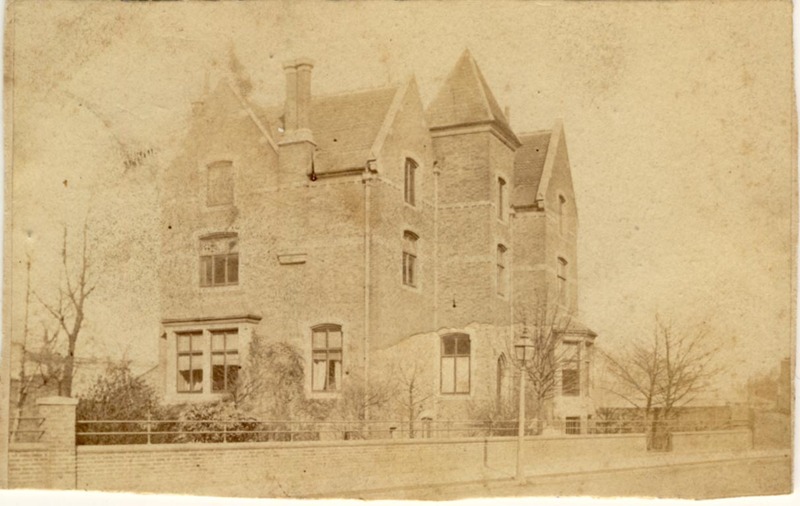 The style of the card mount and the almost identical handwriting on the back of the photograph, suggests that this "residence photograph" was taken during the same period that Guillon was working as a photographic artist in North London [see illustration above]. 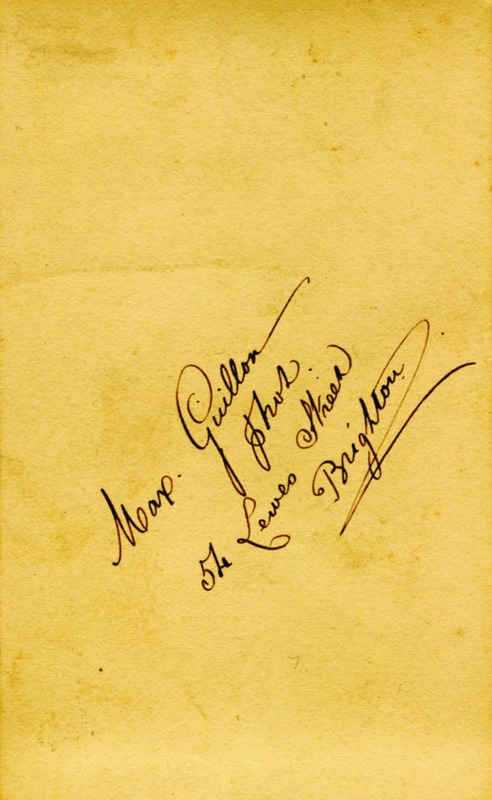 It seems likely that in the 1870s, Maximilian Guillon was a regular visitor to Brighton and divided his time between London and the Sussex seaside resort. By 1886, Max Guillon and his family had settled in Aldrington, a parish located a couple of miles west of Brighton, near the village of Hove, which had been developed into a fashionable residential area in the 1870s and 1880s. In the 1888 edition of Page's Directory of Brighton & Hove, Max Guillon ( printed incorrectly as "Max Grillon" ) is listed under "Photographic Artists" in the Trade Section, with a business address of 4 Westbourne Mews, which is in Aldrington, now part of Hove. "M. Guillon", a photographer of 4 Westbourne Mews **, is also listed in the Commercial Section of a Brighton directory issued the following year. In the Trades section of Kelly's Directory of Sussex, published in 1890, Maximilian Guillon is shown under the heading of "PHOTOGRAPHERS" with a business address of 4 Westbourne Mews, Aldrington. In the section devoted to Aldrington in Kelly's 1891 Directory of Sussex, Maximilian Guillon is shown in the commercial columns as a photographer at 4 Westbourne Mews. ** Westbourne Mews was a small row of four or five houses which backed on to Westbourne Place and ran into Westbourne Street. The Mews was a service street that housed a set of stables with living accommodation above. When Max Guillon lived in the Westbourne area, the stables in Westbourne Mews were used as horse stalls and carriage houses for three "fly" (horse-drawn carriage) proprietors and the owner of a horse-drawn cab. As far as business addresses were concerned, Westbourne Mews, Westbourne Place and parts of Westbourne Street were probably interchangeable. Westbourne Mews and Westbourne Place were situated close to the sea and not very far from the elegant terraces of West Brighton and Cliftonville. The occupants of the stylish and attractive villas in this fashionable area were ideal customers for the particular photographic services that Maximilian Guillon offered. [ABOVE] The trade stamp of Maximilian Guillon, Photographer of Westbourne Place, West Brighton, which appears on the reverse of the cabinet card photograph shown on the right. Westbourne Place backed on to Westbourne Mews and appears to have been interchangeable as a business address. The 1891 census records Maximilian Guillon and his family at 79 Westbourne Street, Aldrington, near Hove. In this period, the area around Westbourne Street became known as West Brighton. 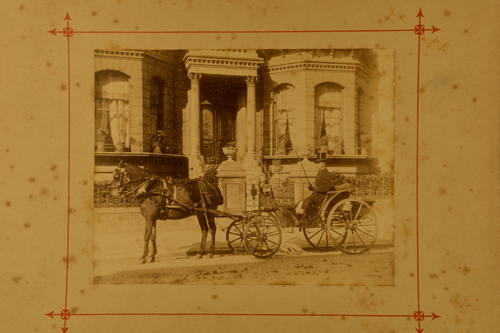 A cabinet format photograph produced by Max Guillon around 1892 gives his business address as Westbourne Place, West Brighton. In 1893, the parish of Aldrington was absorbed by the borough of Hove and in 1894 it became part of the urban district of Hove. During his stay in Aldrington and West Brighton, Guillon carried on his speciality of photographing the residences of comfortably well-off, middle-class families. The 1891 census for Brighton & Hove (including suburban areas like Cliftonville and Aldrington) recorded 176 persons engaged in the business of photography. The total number of self-employed photographers and studio proprietors was fifty-four. The vast majority of the 40 plus studios were primarily concerned with the production of photographic portraits. Maximilian Guillon was one of the few photographers in the Brighton & Hove area who concentrated on the production of "Architectural Photographs" or views of residences. Edward Fox (1823-1899) was a Brighton photographer who was famous as a "Landscape and Architectural Photographer" and he rarely took photographic portraits. The larger, well established studios such as Thomas Donovan of St James' Street and C. Hawkins of Preston Street and King's Road, Brighton produced "Outdoor Work" ( Mrs Eliza Hawkins, the proprietor of the "C. Hawkins" studios, was advertising "Residences, Photographed on Moderate Terms" as early as 1877 ), but studio portrait photography was the mainstay of their business. Max Guillon was unusual in that he produced photographs of residences, almost exclusively. [ I have not seen one studio portrait produced by Maximilian Guillon ]. [ABOVE] A photograph of No. 9 The Drive, Hove by Maximilian Guillon. Printed on the reverse of this cabinet card is the photographer's business address - "M. Guillon, Photographer, Westbourne Place, West Brighton". The words "Houghton. 9 The Drive, Brighton" are inscribed in blue ink on the reverse of the photograph. [ABOVE] The trade plate of the photographer Maximilian Guillon rubber-stamped on the reverse of the large format photograph illustrated above. Maximilian Guillon was working as a photographer from an address near Westbourne Place, West Brighton between 1888 and 1893. 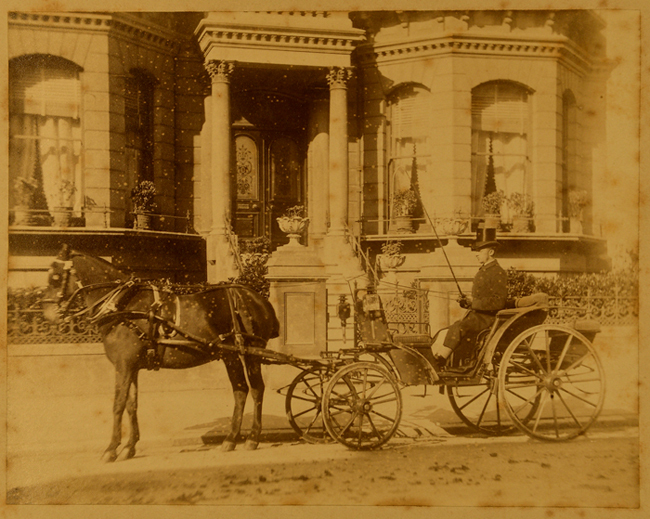 [ABOVE] A photograph of a horse-drawn carriage outside No. 42 St Aubyn's, Hove by Maximilian Guillon, Photographer of Westbourne Place, West Brighton. Printed on the reverse of this large format photograph is the photographer's business address - "M. GUILLON, PHOTOGRAPHER, WESTBOURNE PLACE, WEST BRIGHTON". No. 42 St Aubyn's, Hove was the residence of James Orr (c1825-1902), an Irish-born sheep farmer who had made his fortune in Australia before marrying at the age of 57 and settling in Hove, Sussex. James Orr's wife was Mrs Constance Symonds (formerly Biddulph), a 30 year old widow with a six year old son named Powell Biddulph Symonds (born 1875, New Zealand). By the time this photograph was taken James Orr's wife had given birth to two more children - James Spencer Orr (born 1882) and Gordon Biddulph Orr (born 1886). [ABOVE] A portrait of James Orr (c1825-1902), photographed by William Hall & Son of 80 West Street, Brighton around 1888. 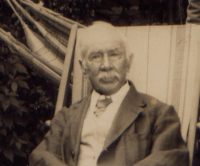 James Orr had made his fortune as a sheep farmer in Australia. 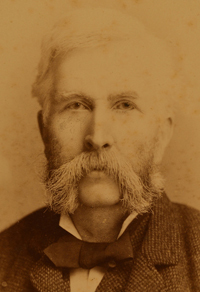 Around 1880, James Orr, then a bachelor in his mid-fifties, returned to England to marry and establish a permanent home in Hove on the Sussex coast. On 20th December 1881, fifty-seven year old James Orr, married Mrs Constance Symonds, the 30 year old widow of Powell William Symonds (1845-1879). [ABOVE] James Orr listed at No. 42 St Aubyn's, Hove in Kelly's Street Directory of Brighton & Hove (1890). [ABOVE] A modern photograph of No. 42 St Aubyns, Hove showing how the building looked in March 2012. 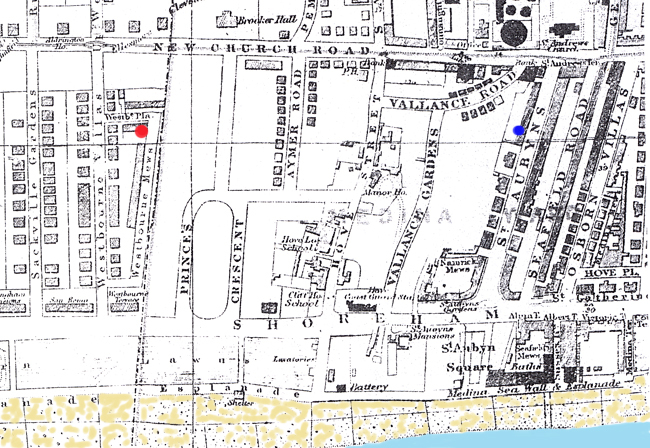 [ABOVE] A detail from a late Victorian map of Hove, showing the location of James Orr's residence at 42 St Aubyns [marked by a blue dot] and the home of the photographer Maximilian Guillon at 4 Westbourne Mews, Westbourne Place, West Brighton. [marked by a red dot]. By 1894, Maximilian Guillon had left Hove and had settled in Thornton Heath, Croydon in Surrey, where he was to remain for the next 46 years. 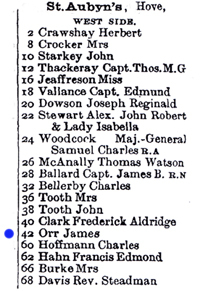 The Court Directory in Kelly's London Suburban Directory of 1896, records Maximilian Guillon at 5 Woodville Road, Thornton Heath, however he is not listed as a photographer at this address in the Commercial Section of Kelly's London Suburban Directory. It is clear that Maximilian Guillon was still earning a living as a professional photographer, but due to the nature of his particular branch of photography, he did not use a studio. When the 1901 census was taken, Maximilian Guillon is shown living with his family in Woodville Road, Thornton Heath, and he is described in the census return as a "Photographer", aged 48. Henri Guillon, Max's son, is recorded as a nineteen year old clerk. No occupation is given for twenty-one year old Florence Guillon, but her sister Nellie (Ellen) is entered on the census return as a " dressmaker", aged 22. ( In 1913, Miss Nellie Guillon was listed in a Croydon street directory as a "costumier" at 26 Woodville Road, Thornton Heath - next door to the family home ). Max Guillon lived on to his late 80s but two of his three children died before reaching middle age. Florence Emily Guillon tragically took her own life on 13th February 1903, a few weeks before her 23rd birthday. 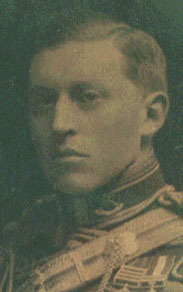 During the First World War, Henri Leopold Guillon became a Gunner in the Royal Field Artillery. He was killed in France on 10th June 1918 at the age of thirty-six, leaving his widow, Mrs Amelia Frances Guillon (nee Duesbury) to bring up their only child, Dennis James Guillon (born 1916, Flixton, Manchester). Max's wife, Mrs Ellen Jane Guillon, died in Croydon in 1938, aged about 80. Pierre Marcel Maximilian Guillon ( known as Maximilian Guillon ) died a couple of years later at Thornton Heath, Croydon on 6th March 1940 when he was about 87 years of age. Nellie (Ellen) Guillon, the last surviving child of Max and Ellen Guillon, died in 1962. I am indebted to Tim Woodward, R. Graham Woodward and Nicky Woodward for providing family history details of the Guillon Family. Graham Woodward is married to Catherine Guillon, the great, grand daughter of Maximilian Guillon. Graham's son, Tim Woodward, has his own website devoted to the Guillon Family [see link below]. Nicky Woodward, Graham Woodward's other son, has recently (June 2014) created a website devoted to the photographic work of Max Guillon and his brother Valentin Guillon [see link below]. I am grateful to Kit Houghton, the grandson of Mrs Florence May Orr, who provided the photograph by Maximilian Guillon, featuring his great grandfather's residence at 42 St Aubyns, Hove. 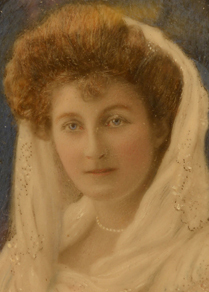 The portraits of James Orr and Mrs Florence May Orr (formerly Barley) were also supplied by Kit Houghton. Tim Woodward is researching the life of his great great grandfather (Maximilian Guillon) and his maternal great grandfather (Henri Leopold Guillon) and tracing the story of the Guillon Family. Tim is currently working on a Family History website called "The Guillon Family Tree" and would be pleased to hear from anyone with information on the Guillons and any person who might be related to the Guillon Family. Click on the link below to view Tim's detailed and attractively presented website. Nicky Woodward has created a website devoted to the photographic work of Max Guillon (1852-1940) and his brother Valentin Guillon (1855-1945). Nicky Woodward's website, entitled Guillon Photographers 1870-1945, includes biographies of the two photographer brothers and galleries featuring the photographs produced by Max Guillon and Valentin Guillon during the period 1870 to 1945. Nicky Woodward's excellent website displays carte-de-visite and cabinet photographs and a number of real photograph picture postcards produced by the two brothers during their very long photographic careers.